If you’re not familiar with it, check it out. It’s a great read. His/her (Sorry BJ, I haven’t read enough yet to make that determination) openness and honesty was remarkably refreshing and thought provoking. Later in the day, while I was making pies, pot pies that is, chicken pot pies to be exact…no…not zipping open a carton and tossing it in the oven but actually making them…I found myself deep in thought while mixing up the dough for the crust. I had the flour and salt, blended together, in the bowl and plopped in the needed amount of Crisco. After turning to put the can away I looked back to the bowl and thought…Hmmmm, sometimes I feel like that’s how God hits me with His word…just plops it down in the middle of any given situation. As I began to work the shortening into the flour the 3 substances became one. I then mixed in a little water to pull it all together and a smooth dough appeared. I thought…See…Father, Son, Holy Spirit and us! As I rolled the dough out, it became more smooth and took on a different shape…no longer a single blob but 12 perfectly flat, round disks. Nothing like a little pressure to get things where they need to be! I eased them into the pans and then filled them with the tender chicken, fresh veggies and rich, creamy sauce. 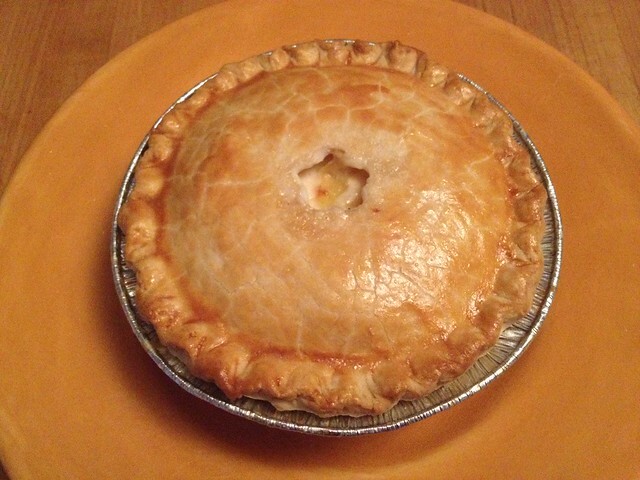 Next…slipped on the top crust to encase the yummy filling and thought…God shapes us and encases us in His loving arms! Remember…God, filling us with His Spirit, shaping us into what He wants us to be, makes for one tasty morsel!